In case you haven’t noticed, patio heaters are getting more attention than ever before. Outdoor heating is a growth industry and there’s no sign of it slowing down. For one thing, restaurant owners have discovered that adding outdoor seating and keeping their patrons warm and comfortable translates to more customers and more revenue. In addition, homeowners are always seeking new ways to extend their outdoor living during more weeks out of the year. There is, however, a negative side to this growth trend. In the past decade, cheap upright portable propane patio heaters have been popping up in big box stores and online retailers all across North America. In an effort to capture piece of the patio heater market, manufacturers and their retailers have flooded stores with flimsy, and (often ineffective) heaters that don’t last more than 2 or three years. This fact does not reflect well on the industry as a whole. Enter IR Energy, a manufacturer with a different approach: “Why not build gas patio heaters perform better and are made to last?” Going in, they knew their heaters would likely cost more, but they would be higher in quality and meet the test of performance coupled with longevity. Result: The EvenGlo upright patio heater, a heavier duty commercial grade upright heater that emits usable radiant heat energy to a 56% greater heat circle than it’s next best competitor and has a full 5 year warranty. 1) Spreading heat in a broader heat footprint. Most all hanging heaters required the ceramic burner face to be recessed inside the heater cabinet, thereby limiting the “throw” of radiant heat outward (to the sides and ends). For restaurant owners particularly, this meant that more heaters were needed to cover seating areas. 3) Clearance requirements. One leading brand with a 34,000 BTU output requires a top clearance of 18 inches. For lower ceiling areas (ie. 9 ft.), this means that the bottom of the heater would be around 7 ½ feet high. With an 8’ ceiling, the heater would be at about head level! Clearance issues have always been a problem with hanging patio heaters. The Habanero hanging patio heater solves these issues and more. First, the Habanero ceramic burner is brought to the surface and is surrounded by a polished reflector to direct heat energy to a broader area. This means fewer heaters to do the same job! Next, the Habanero comes in three different sizes, including a 50,000 BTU model – designed especially for higher ceiling areas and colder days to throw more heat energy to the people zone. Finally, even at the higher 50,000 BTU output, the Habanero has top clearance requirements equal to or less than that of competitor’s lower BTU heaters. In fact, with the optional heat guard, the Habanero can be as close as 3” from a combustible ceiling! Perhaps the biggest benefit of the Habanero is that it meets the acid test. In a recent live burn demonstration, patio heating business owners were invited to stand beneath and to the sides of a 34,000 BTU heater from the competition. They were then asked to stand beneath a 20,000 BTU Habanero (the smallest model available in the Habanero line-up). All agreed that they felt way more heat to the perimeter of the lower output Habanero than with the 34,000 BTU competitor! Just think of it. More useable heat energy, fewer heaters to cover the same area, and 42% less fuel consumption! That’s an amazing feat! And a huge benefit to restaurateurs who are always looking for ways to lower operating costs. In the realm of outdoor patio heaters, the Habanero is as green as you can get! 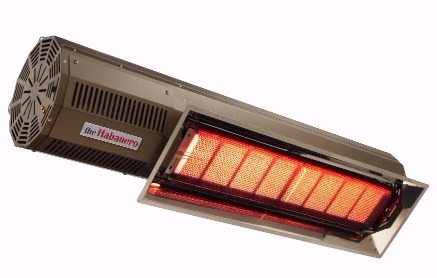 The Habanero heater is controlled using a two-stage control switch and can be operated independently or in sequence with other heaters. Available in black, dark bronze or stainless steel and in natural or propane gas.